Thanks so much Ashley. 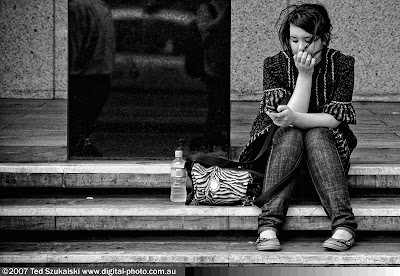 I have a few friends who are do that... one of many reasons I have not had my cell phone over 6 months. (started driving, that's why I have it). But that is a topic that needs to be addressed much more than it is today, especially with all the low self-worth girls have today. again, thanks so much! I think the most shocking part of reading this blog, for me atleast, wasn't the stats but the fact that the first time i read the stats, they didn't surprise me at all. I can't believe that I just expect that of the world and those scary stats don't even make me have the same reaction they made you have Ashley. We hear about this stuff at school and through the media and it's all in your face and I think it gets to a point where you're desensitized to it and don't think anything of it. I can't even imagine the scary world my daughter's going to face as a teen if this is what is happening now. Thanks for really opening my eyes and making me realize how messed up society really is and how hard you have to rebel against the standards of the world. Ashley - Many thanks for your boldness in telling it like it is. I saw the feature on ABS news this weekend - and our family had a good chat about all this. Makes me glad we held our ground and didn't let our kids get cell phones till high school. But once they get them - our vigilance is critical. I'm grateful my kids are open and KNOW mom and dad will occasionally check their phones. 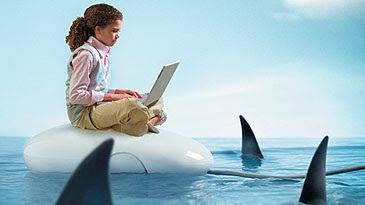 The photo of the little girl with the sharks in the water is such a vivid illustration of what we are dealing with. Blessings to you and Shay at Christmas. why wouldn't you want a messed up person to read this blog? it could and probably would change their heart. Also, what's up with the pictures of Miley and Vanessa? i think this is a great blog entry and is very moving. I put the pic of Miley and Vanessa b/c I briefly mentioned them in the post on "sexting" b/c they have been involved in it. also I do want messed up people reading the blog...i want anyone who wants to to read the blog. I'm messed up and i write the blog :) So bring on anyone and everyone...just as long as they know it's a fun, easy-going blog!!! Thanks! Thanks for being bold and speaking truth to the young women of our world! I enjoy reading your blog and seeing all the cute photos! Hope you and Shay are doing well & give my love to the Kanakuk director families! !